It's December and that can only mean one thing! Well, actually it means a few things... but ONE of those things is the return of Christmasongs! What better way to kick off a new year of my pah-rum-pum-pum ramblings than with a ranked run-down of The Killers's Christmas singles? Last week, they just released "Dirt Sledding" - their tenth consecutive Christmas single - so a full decade's worth of seasonal singles is certainly deserving of a (completely arbitrary) arrangement based on a (completely arbitrary) set of factors and calculations. 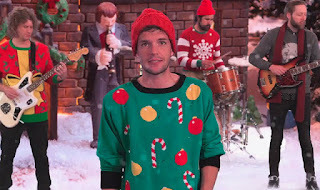 Between the merry merit of the musicality, the inclusion of special guests (in the song and/or the video), the video's wealth of tacky Christmas apparel, and each song's overall level of "Christmasness," there's a lot to be dissected regarding the band's yearly yuletide singles. As a side note, it's also important to note that, along with actually writing some really amazing Christmas songs year after year (even during seasons of inactivity), The Killers also donate the proceeds from the sale of these Christmas singles to the Product Red campaign to help fight HIV/AIDS in Africa, so go buy all of them RIGHT NOW! Peace on Earth and goodwill to men, indeed. With any ranked list, you've got to start somewhere, right? Their 2010 offering "Boots" is by no means a bad song, there's just something about it that doesn't quite seem to stir the Christmas spirit in me like their other singles do. It's actually pretty surprising, seeing as the song does it's best to set the seasonal scene. It opens with a snippet of dialogue from It's A Wonderful Life (which also gets a lyrical shout out) and includes mentions of "cinnamon candles burning/snowball fights outside" among its lyrics. There's even a snow globe on the cover art. "Boots" was released during a time when the band was on a brief hiatus, so there's nothing bad you can say about a song that shows their devotion to their yearly commitment, their fans, and Product Red. "I Feel It In My Bones" is the second song in the band's "Murderous Santa" trilogy and it continues the story that was started in their earlier "Don't Shoot Me Santa" single (more to come on that song later). Ryan Pardey reprises his role as the vengeful Santa in both the song and the video and he nails the maniacal jolly fat man role perfectly. The pulsing thump of the track's musical bed makes "I Feel It In My Bones" sound like a Battle Born outtake, which is no surprise as it was released between the album's second and third singles ("Miss Atomic Bomb” and “Here with Me”). Just released last week, "Dirt Sledding" is the newest entry in The Killers's Christmas canon and it sure is a fun one. After a low-key, piano-led intro, the song turns into a rockabilly rave-up that ends up being a little Elvis, little Queen, a little Grease, and a little 80s sitcom opening ditty. Ryan Pardey returns to complete the "Murderous Santa" trilogy and cinema legend Richard Dreyfuss even contributes a voice-over (which includes the surprisingly significant lyrical nugget that Brandon Flowers weaves into many of his Christmas tunes: "There's something to be said for being present/Not just getting one"). Bonus points for the Sixteen Candles reference ("Red Porsche 944 like Jake"), which shows up in the video as well. After everything that Brandon and Santa have gone through, it's really nice to see the two ride off into the sunset together. First off, this song thrills me just for the fact that it tackles one of the most non-tackled elements of the Nativity story: the difficulties that Joseph must've faced in regards to public scrutiny ("Are the rumors eating you alive, Joseph?"). I also appreciate how The Killers approach the issue with more questions than statements. Second, the fact that they brought in two of my favorites singers, Elton John and Neil Tennant (Pep Shop Boys), to sing on this song makes it even more special. Having three vocalists with such unique, crystal clear vocal tones sing together is such a nice touch on this track and the sparse piano-driven instrumentation really lays back to let the trio's golden voices shine in all their glory. Third, the video for "Joseph, Better You Than Me" is really interesting as it is almost entirely comprised of scenes from The Living Christ Series from 1951, a mini-series that should be recognizable to most anyone who attended a church in the 70s or 80s, where it was a good seasonal Sunday School staple. Possibly feeling that "Feliz Navidad" had a stranglehold on the merry-achi (nailed it) side of Christmas for far too long, The Killers joined up with Wild Light and Mariachi El Bronx to bring a little fiesta feel to their 2009 Christmas single. Apart from setting the scene with the opening line ("Well, I woke up Christmas morning and what did I see?") and a trio of Christmas song references ("Baby, It's Cold Outside," "Deck the Halls," and "Silent Night"), there's not too terribly much of a holiday feel to "Happy Birthday Guadalupe!". However, the song is written really well, it's super fun to listen to, Mr. "Dylan from Beverly Hills, 90210" Luke Perry is in the video, AND the song appears in a new Christmas movie coming out this year (Christmas Eve with Patrick Stewart). That's what you call a win-win-win-win! This song is so fun and festive that if you catch me on the right day, I might tell you that it's my favorite Killers's Christmas single. If the song sounds like it's the best John Denver song he never actually wrote, it's because the lyrics are taken from an old cowboy poem written by Larry Chittenden all the way back in 1890. Apart from a few geographical tweaks made to honor their Las Vegas roots (Texas references are updated to Nevada ones), the lyrics are essentially the same as you would've heard them back in the late 19th century. In the same way they started with the old lyrics and updated the music for a more modern flare, the music video follows suite. It starts as a typical Wild West scene with desert landscapes, horses, cowboys, and townsfolk... and then the robot aliens show up. This one makes it onto a lot of my Christmas playlists every single year. "A bullet in your what?!?" Ah yes, the wonderful beginnings of the "Murderous Santa" trilogy and possibly the best combination of oddness and greatness you'll ever encounter in a Christmas song. I remember hearing this song for the first time on the radio and having my mind blown wide open to the option of a whole different type of Christmas song to fall in love with, namely ones by The Killers. The lyrical back-and-forth between Brandon and Santa is downright hilarious and the various musical left turns all flow together so naturally for such diverse non-traditional elements. What shouldn't necessarily work on paper delivers in seasonal spades in the finished product. The music video amps up the quirky awesomeness even more and the arresting visual of Ryan Pardey's maniacal Santa is so good that it almost demanded that it not be a one-time thing. Oh man, I love a really good, sad Christmas song. Where we usually have to rely on bluesman Charles Brown to fill that holiday hole, The Killers really stepped up to the plate with "Christmas in L.A." in 2013. Featuring a little help from Dawes, especially the sublime vocal performance from Taylor Goldsmith, "Christmas in L.A." channels a '70s country rock ballad vibe and it chronicles a disconnected actor's decision to stay in L.A. for a lonely holiday. With such poignant lines as "I've played so many parts, I'm not sure which one's really me" and "Another burnout in a tank top, who seems to bask in his decay," the lyrics perfectly paint the isolating and depressing scene. However, the line that always hits me the most is: "There's a well-rehearsed disinterest in the atmosphere/I don't know if that's what this town gave me or if it lead me here." Man, so gorgeous. The music video is pretty amazing as well and it features Owen Wilson as the song's narrative focus and veteran character actor Harry Dean Stanton in a cool cameo and video-only voice-over. Apart from the 'White Christmas" inclusion at the end (which was enough to get Irving Berlin a co-writing credit), this song can be queued up at anytime of the year, another sign of a perfect song, that just so happens to be a really nice Christmas as well. I know it can be pretentious to claim that the first of something is the best, but seriously, The Killers absolutely nailed it right out of the gate on "A Great Big Sled," their very first Christmas single from 2006. From the writing to the recording to the instrumentation choices to the lyrical content and every other element in between, "A Great Big Sled" is a perfectly-hitting-on-all-cylinders Christmas song. The pulsing energy and heavy dose of holiday spirit in the song make it must-have on any Christmas playlist and its huge chorus is so much fun to sing along with. The female voice on the song is Toni Halliday (from Curve), wife of the legendary uber-producer Alan Moulder (who produced this track as well). I can still remember hearing this song on the radio during my morning commute the day it debuted and being immediately enthralled by it. While I was super excited to hear a band that I dug so much doing such an awesome Christmas song, I had no idea that it was just the start of them delivering an incredible entry for each following season. I still love "A Great Big Sled" just as much as when I was first struck by it and try as I might to not judge each new Killers's Christmas song by this first template, it's really hard not to. Until they find a way to top it, "A Great Big Sled" is holding hard at #1 for me. If you ever find yourself receiving a Christmas mixtape from me or if you attend one of my famous "Ho-Ho-Hodge Holiday Hangouts," you can count on a heaping helping of "A Great Big Sled" to spike your Christmas spirit.